On September 1, 1939, Germany invaded Poland. A week later, Jadzia’s hometown of Łódź was under German control. Social and cultural life was curtailed and many people lost their jobs. The Nazis deported several million Polish citizens to Germany for forced labor, to serve the German war economy. Jadzia was dismissed from her post at the Anna Maria Hospital in 1940 and reassigned to work as a general practitioner. 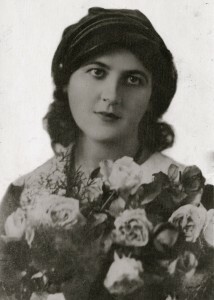 That same year, the Jewish population of Łódź was forcibly moved by the German authorities into a small fenced area that became the Łódź Ghetto, which encompassed Jadzia’s old neighborhood. 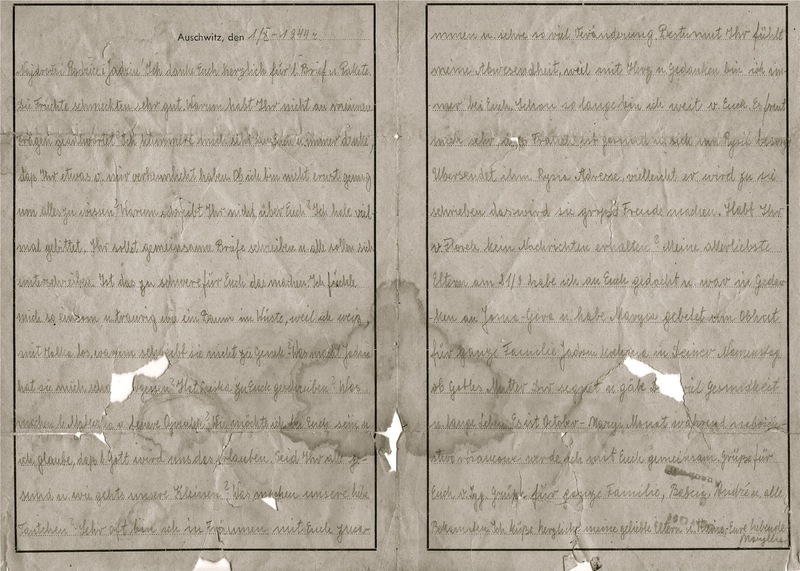 The Nazis closed the church of her baptism and turned it into a warehouse for plundered Jewish goods. 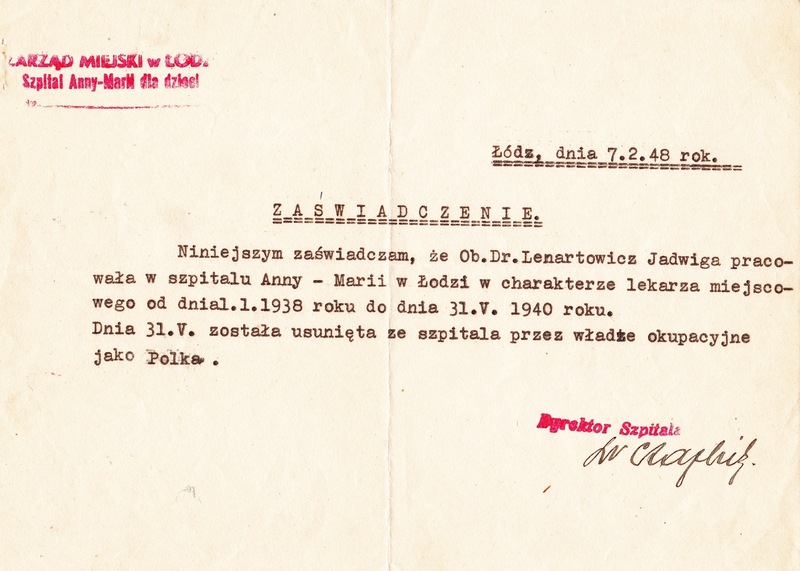 In 1942, two of Jadzia’s sisters were arrested for their involvement in the Polish resistance movement. Marysia was eventually sent to the Auschwitz concentration camp. Basia avoided a similar fate and went into hiding. 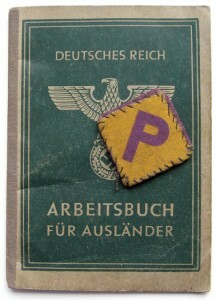 (59) Identity work book issued by the German authorities to foreign forced laborers, along with a patch that all Polish forced laborers had to wear (1942). For image credit, see below. 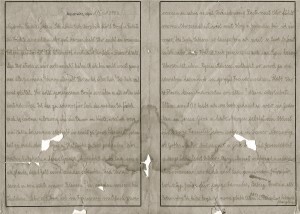 (66) Document acquired after World War II, declaring that “Dr. 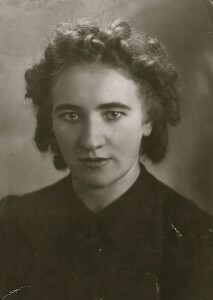 Jadwiga Lenartowicz worked in the Anna Maria Hospital in Łódź as a medical resident from January 1, 1938 to May 31, 1940. On May 31 she was dismissed from the hospital by the occupying forces because she was a Pole” (in Polish, 1948). 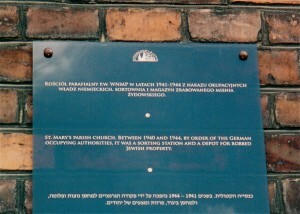 (15, 77) Plaque on wall of the church where Jadzia was baptized, located within the Łódź Ghetto during World War II. 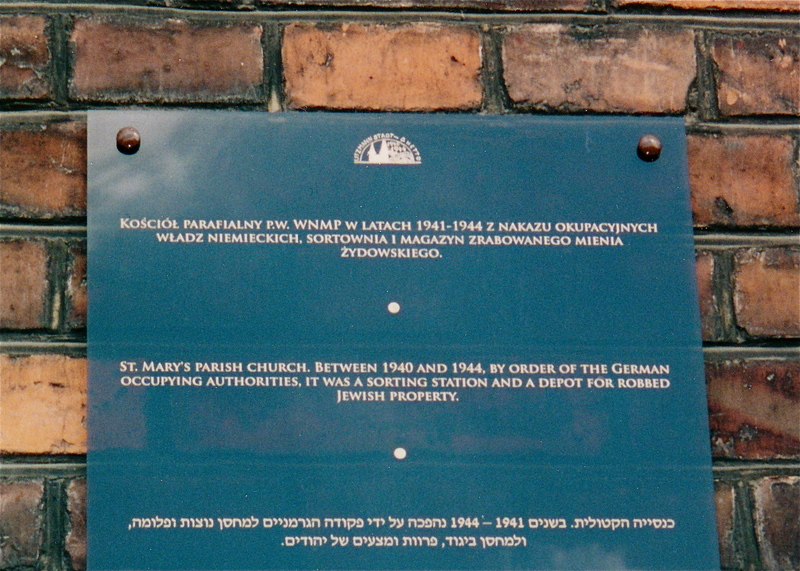 The Nazis used the church as a warehouse for stolen Jewish property (Łódź, 2005). 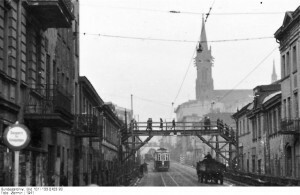 (77-78) Bridge across Zgierska Street, allowing Łódź Ghetto residents to cross from one side of the street to the other. This thoroughfare, off limits to Jews, ran through the ghetto, connecting one side of the city to the other. In the background are the spires of the church where Jadzia was baptized (Łódź, 1941). For image credit, see below. (88) Jadzia’s sisters, Marysia and Basia Lenartowicz, a few years before their arrest by the Gestapo (Łódź, 1938). 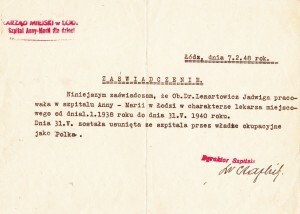 (89-90) Letter written by Marysia Lenartowicz from Auschwitz-Birkenau Concentration Camp, addressed to Jadzia and her parents (in German, October 1, 1944). 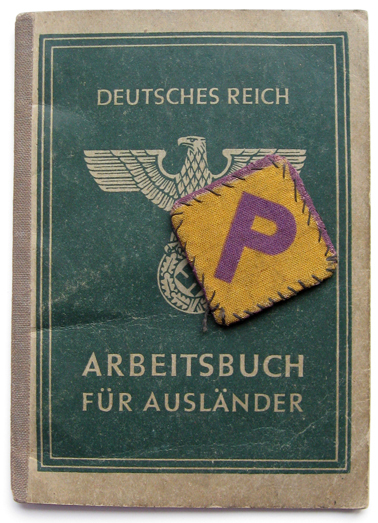 Foreign forced-laborer work book and “P” patch: Available under Wikipedia Creative Commons CC0 1.0 Universal Public Domain Dedication, “Arbeitsbuch_Fur_Auslander_1942.jpg” from http://en.wikipedia.org/wiki/Forced_labour_under_German_rule_during_World_War_II. Bridge in Łódź Ghetto: Courtesy of the collection of the Deutsches Bundesarchiv. Polen, Ghetto Litzmannstadt.- Menschen auf Brücke (Verbindung der Ghetto-Teile), im Hintergrund Straßenbahn, Kirche; PK 689. Sign. Bild 101I-133-0703-28; photographer: Zermin.